Start your New Year with TEC Club event and join us on Thursday, January 9th, for a discussion with Carol Sands, Founder and Managing Partner, The Angels’ Forum and The Halo Funds. Carol teaches a course on Angel Investments at Stanford University. Carol kindly agreed to deliver a short overview version of the course at TEC. Making an investment in an early-stage startup is fun and easy to do, but making a profit from angel investment is not a trivial task. Carol teaches how to increase the probability of success by modifying the initial selection process, productively monitoring the investment’s progress, and monetizing investment at the right point. Carol Sands started her career working for large companies but switched to owning and running startups in the 1980s. She founded The Angels’ Forum, a group of professional private equity investors, in 1997. The Halo Funds, a Silicon Valley-based venture capital fund, raised its first fund in 2000 and is currently investing from Halo III. Carol also works with both commercial and nonprofit boards. Join us on November 14th to get the latest insights into the success story of RingCentral and its founder and CEO, Vlad Shmunis. Vlad went all the way from founding a startup, bringing in on board some of the best venture funds in the Valley (Sequoia & Khosla Ventures), and taking RingCentral to a $100M IPO just last month. Don't miss this exciting story and an opportunity to learn from the first-hand experience straight from the founder! Learn his business secrets and ask him questions. 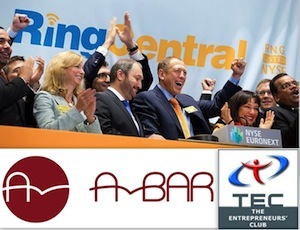 Hang out and share drinks and snacks with Vlad as well as a group of like-minded entrepreneurs, investors, executives and other professionals - members of AmBAR (www.ambarclub.org) and TEC Club (www.tecglobal.org). Spaces for SVOD’13 are filling up quickly! With exceptional roster of speakers, startups and VCs this year’s conference is shaping up to be the main technology and entrepreneurship event of the season. Network in the informal (no jackets or ties) atmosphere and make deals! Do not miss the chance to move your business forward, go to www.svod.org/attend and register now! If you wish to present your company at SVOD DEMO to the audience of angels and venture capitalists, please shoot us an email at info@svod.org. Also, if you know some forward-thinking entrepreneurs building the next big company around you, do not hesitate to let us know asap! Join us for this series of actionable, interactive, hands-on workshops taught by experts in the field. Hone your leadership and management skills and take charge of your career and your company’s success. Discover how to develop a personal brand, build and leverage relationships on-line and off, and lead your team and company with confidence. You will leave these hands-on workshops with specific ideas and best practices to put into action immediately. Join TEC and JHTC celebrating Israel's birthday Silicon Valley style, by checking out a sampling of innovative Israeli startups. This unique event will bring together entrepreneurs, venture capitalists, angel investors, potential partners and employees for a night of exceptional networking opportunities. There will be six early stage startup companies present. They will each give brief pitches and then be available at individual tables for further discussions and demos. What better way to celebrate the birth of Israel as a nation than to witness the birth of these high tech Israeli companies. Mark your calendars and join us on March 21 (Thursday) in Palo Alto for our famous TEC Pitch! The event includes a panel of venture capitalists, 10 min pitches from 8 pre-selected companies and extensive networking. On January 24, 2012 The Entrepreneur’s Club hosted Guy Kawasaki at the WilmerHale Headquarters in Palo Alto, California. Kawasaki shared advice from his new book, “APE: Author, Publisher, Entrepreneur - How to Publish a Book”. Abundant with useful advice and ingenious remarks, Kawasaki’s speech was acclaimed by the crowd of Silicon Valley professionals. Kawasaki presented an example of what a proper speech should encompass, breaking it down into 10 distinct parts. Mark your calendars and join us on February 21 (Thursday) in Palo Alto for our famous TEC Pitch! Mark your calendars and join us on Thursday, January 24th in Palo Alto for an exciting evening with Guy Kawasaki – a bestselling author of 10 books on entrepreneurship, a Silicon Valley venture capitalist, a legendary Apple Fellow, and now an Android Fan. TEC World Leaders Series are exciting and enlightening keynotes or fireside chats with the gurus of the technology world. Among our speakers were: Pitch Johnson with the stories from the Silicon Valley tranches, Steve Blankwith manual for startups, Tim Draper on how to become a venture capitalist, Marten Mickos with his life story and vision on how to build successful businesses, and Charles Giancarlo on how to buy Skype , turn it around and make $5B of profit in less than two years.